Mayor Zimmer and I with my two 9/11 handprint flags. 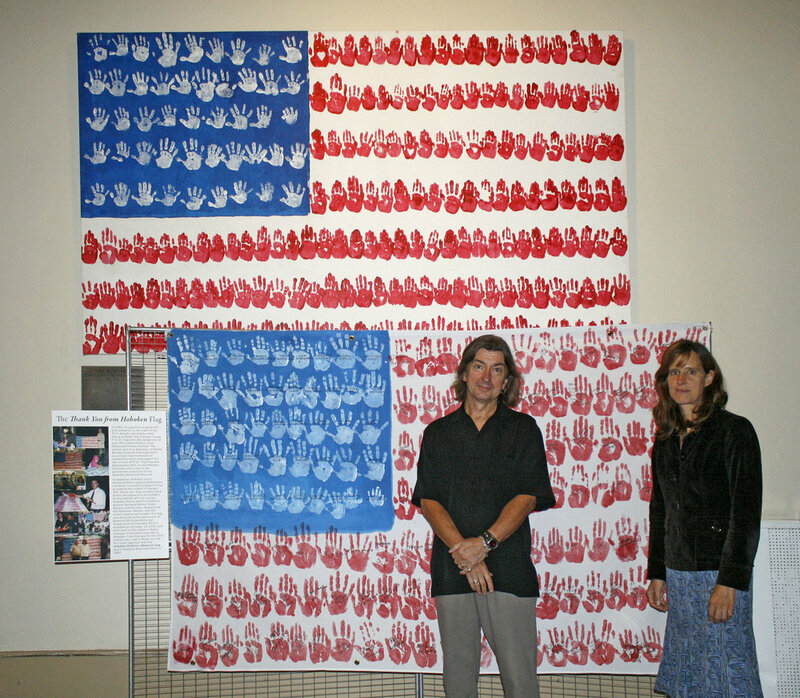 Two handprint flags I created to commemorate the victims of the 9/11 attacks will be displayed together for the first time for the month of September. Mayor Zimmer and I with the Thank You from Hoboken flag. 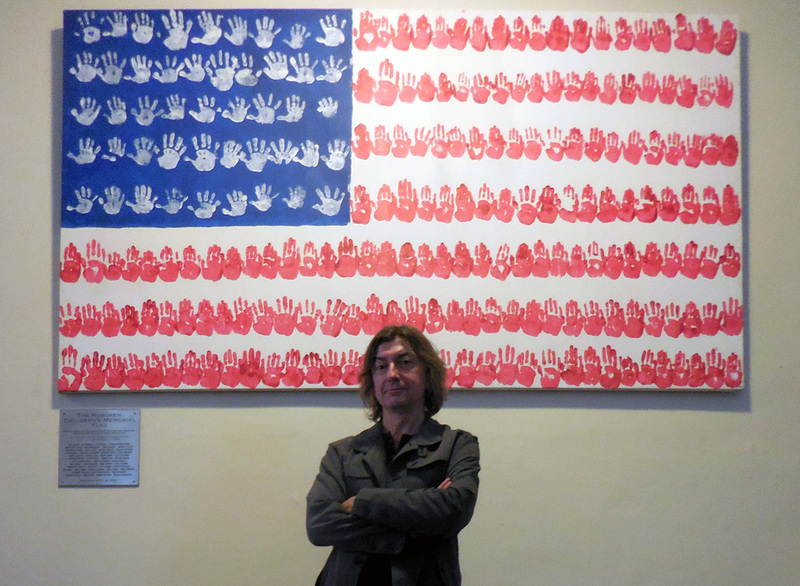 After I made the Hoboken Children’s Memorial Flag I organized Hoboken residents to create a handprint flag to send to the school in Georgia. 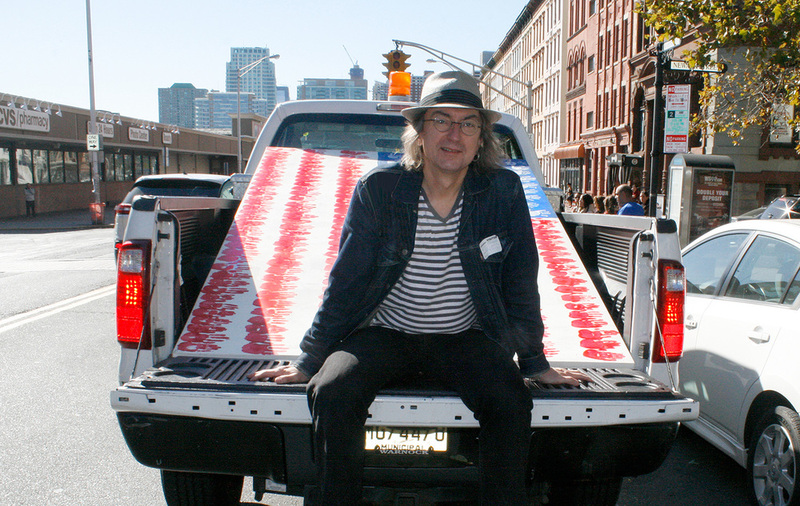 The Thank You from Hoboken Flag includes handprints and signatures of members of the families of 9/11 victims, Hoboken Police and Fire Fighters, Senator Bernard Kenny, Mayor Roberts and his wife, people from the Homeless Shelter, and the artist’s family and friends. The flag was finalized at the dedication of Deborah Williams Memorial Playground at Columbus Park in Hoboken on October 12, 2002, and then sent to the school in Rome, Georgia. It has been returned to Hoboken from Georgia for the 15th anniversary, and is shown for the first time together with the Hoboken Children’s Memorial Flag, in the lobby of City Hall for the month of September. A video shot in my studio/home.